This portfolio reflects assignments that I used in my Research Methods class. The Social Science Letters assignment was an attempt to have students use a form of writing they were perhaps more comfortable with while still writing about academic subjects. In ”Engaging Ideas”, John Bean suggests that student writing sometimes suffers not because the material is difficult but because the form is foreign to them. I thought that having students write a letter to a missing student where they explained some basic material about a social science would be a useful exercise early in the term. The Zimbardo Lesson Plan includes instructions for an active learning class on Philip Zimbardo’s Stanford Prison Experiment that has several goals. The aims of the in-class lesson are to have students reflect individually on the film in a short writing exercise and then to work in groups to answer a specific question in a single sentence. Groups must then debate and defend their answers through a facilitated discussion before re-writing their sentences in a series of revisions. It is hoped that students tackle the problem of writing a thesis statement for a difficult problem that does not have an easy answer. The lesson involves a take-home writing assignment that asks students to reflect about the material in relation to their own lives. One goal of active learning is to allow students to see the relationship between academic work and their everyday lives. The “What it does, What it says” assignment below is an exercise that I began in class and then had students complete at home. The exercise is designed to have students reflect on the format as well as the content of academic writing in order that they understand how to order and arrange an essay. I found that the exercise was also a useful way to think about an outline for an essay and thus returned to it several times throughout the term using different material. Perhaps my most successful exercise was having students write “what it does, what it says” sentences for a number of different essay questions that I suggested might be on an exam. Students worked on them in class and once they showed me that they could lay out the format and content for a question I allowed them to move onto the next question before finally giving them the actual exam question. I did this in the week before the exam, perhaps in the class immediately preceding it. Bean suggests that providing students with questions prior exams will often produce result in greater thought and better writing on the part of the student. I did find that the quality of the responses was higher than usual and consequently enjoyed marking them. B. Formal Writing Assignments The longer formal assignments that I assigned this term were in a complementary class on the History of Science and Technology and Research Methods. In both cases I tried something new. In Research Methods I was inspired by comments at a Social Sciences meeting where it became clear that the research project requirement for the course did not have to be a sociological survey and instead could be a type of research conducted by any social science discipline. Although I still assigned a survey project early in the term that was done in groups, the large project in my course was a history essay. I gave my students the choice of several different topics and provided them with the readings to decrease the possibility of plagiarism or cheating. I provided different resources that can be seen below, as well as a scaffolded assignment where sections built on each other and drafts were a requirement. The second formal assignment was something I tried in a complementary class on the History of Science and Technology. This assignment grew out of my thoughts around different aspects of WAC/WID. One idea was that student writing often suffers when confronted with a new format, specifically the academic essay. I decided that in this course it was more important that my students engage with the material (thus thinking like a historian) and work on their written communication skills than it was for them to write an academic essay. Because the course was on Science and Technology, and I am interested in the impact of such things on the everyday lives and bodies of people, I devised an assignment where students had to read academic sources about the use and impact of science and technology during the First World War and then write a letter from the position of a soldier in the trenches to someone back home in England or Canada. This was a scaffolded assignment were students were required to produce a proposal and an annotated bibliography. 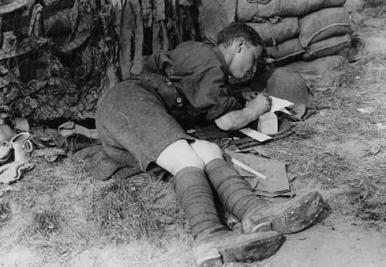 As preparation for the actual letter-writing, I had students read examples of letters written during the war, as well as poetry that portrayed the experience of trench life, in order for them to gain an understanding of genre and style. The results were a joy to read. Many students wrote much more than the requirement, engaged with the sources (providing proper academic references) and displayed an understanding of the material that was greater than what I believe I would have received from an essay assignment. One concern that many teachers express about assigning writing in their classes is that it will increase grading. John Bean offers several solutions to this problem. I tried out two different methods. For all informal writing assignments I used a 3 point scale where a (+) indicated a response that showed critical engagement with the subject and offered insight beyond merely answering the question, a (√) indicated a response that met the requirements of the assignment but did not offer anything beyond that, a (–) indicated a response that did not meet the minimum requirements of the assignment in terms of content or thought. I rarely provided comments on these assignments and mostly used them as a means to monitor student understanding of the subject matter and as a method of letting students work through problems on the page. I found that most assignments were quick to read (being under 200 words), quick to mark and informative as I got to understand my students and their learning path in a deeper way. Over the term I became less satisfied with the limits of the 3 point scale and have thought about using a 4 or a 5 point scale to better differentiate the quality of student work. The second form of grading that I used was rubrics. I had not used them previously but was interested in trying them out. I ended up using them for all of my exams and most of my longer assignments for this term. I modeled mine on those of a colleague, Jocelyn Parr, and ones in the chapter of Bean’s book devoted to evaluation. Over the course of the term I increased the size of my comment boxes and although I will continue to tinker with my rubrics I’ve found them an invaluable help with grading. While their greatest advantage for me has been the decrease in time it takes to grade assignments, I’ve found that when I’ve handed them out along with exams and before drafts of essays students are then able to tailor their work to my expectations.